Thanks to the one-year development cycle of the Torchlight games, gamers might see Torchlight 3 before Diablo 3 hits stores. Torchlight 2 is due out next Spring, but Runic Games CEO Max Schaefer is apparently already thinking about the third installment in the franchise. 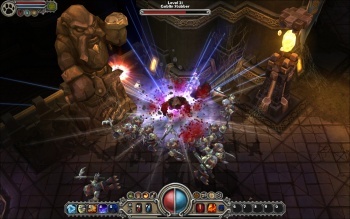 According to Schaefer, gamers might get to see Torchlight 3 before Blizzard releases Diablo 3. The scary thing is that the man is actually serious. Speaking to Joystiq, Schaefer explained that this hypothesis was based on the fact that Runic games has a goal to never get bigger than 40 employees. This "efficient" team size helps ensure that the studio's games have had a relatively quick development schedule (both Torchlight games have taken less than a year to create). Meanwhile, according to Schaefer, "[Blizzard has] an impossible task. Blizzard can not get away with doing a Torchlight 1. If they put out a single player game, an RPG that's kinda stripped down for $20, people would say, 'What the hell happened to Blizzard?' They don't have that luxury. Everything has to be super epic. More epic than anything that's come before, more epic than World of Warcraft. They have to do that. It puts them in a really tough spot, I don't envy them. It has to be perfect." When asked if he was being serious about getting another Torchlight game out before Blizzard releases Diablo 3, Schaefer confirmed his opinion: "I really think we will, I'm not joking about it. I'll be the first to buy Diablo 3, I'm a huge fan. I just know what it's like over there." Of course, Max Schaefer knows what it's like working on the Diablo games for Blizzard based on firsthand experience. He was one of the co-founders of Blizzard North, the studio that developed Diablo and Diablo II.